It’s not uncommon for a student (or their parent) to be disappointed in their grades after the first semester or two of college. Some students even end up on Academic Probation – which can happen to a student if their GPA is under 2.0 after their first semester at UWM. College can be a huge adjustment academically for several reasons. · Academic Rigor: College-level work is different from high school. Professors often don’t provide as much direction as high school teachers and may have different expectations on the level of work needed for an A. Many students need some practice before their confidence, or self-efficacy, improve along with their grades. Typically somewhere between 20 and 25 percent of students indicate they are struggling in at least two courses. · Time Management: Students are learning to manage their time in a different way. They no long have study halls or reminders on due dates throughout a well-structured day. They must set aside time to attend class, work, connect with friends, study, join a student organization or intramural sport, apply for scholarships, etc. If they aren’t studying at least 12 hours a week their chances to do well in their courses goes down significantly. · Test Anxiety: One in three first year students at UWM this fall indicated struggling with test anxiety because of fear of failure, lack of preparation and/or a poor test history. 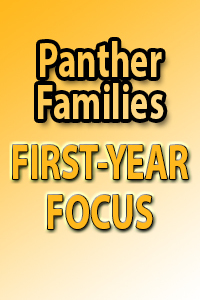 Some students may qualify for services through the Accessibility Resource Center while others need Academic Coaching through Panther Academic Support Services. The most important thing is to have an open and honest conversation with your student about their grades and your expectations. Make sure you listen to your students concerns, as they will need your support to improve their confidence and overcome any perceived barriers. UWM has lots of resources available to help students get back on track as they return for the spring semester – all they need to do is ask.